Sheffield Eagles' Ryan Millar in action against Swinton Lions. 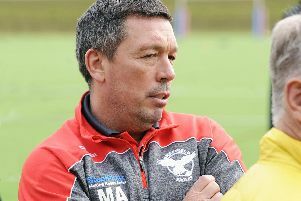 Sheffield Eagles chief Mark Aston described their opening day demolition of Swinton Lions as ‘pretty special’ after his side made the perfect start to the 2019 season. The Eagles, in front of their biggest crowd at the Olympic Legacy Park, stunned the visitors with a destructive performance, passing 60 points for the first time since victory over Workington in September 2016. Aston hailed the dominance, and was equal in his praise for his side’s fluid attacking play, alongside a solid defensive performance. "We looked sharp. We looked clinical. We looked like we knew what we were doing,” Aston beamed to The Star. With no competitive run-outs prior to the start of the campaign, the Eagles could have been forgiven for showing some early season ring-rust. But Aston’s side were electric from the first whistle, with Swinton simply not allowed to settle during a bitterly cold afternoon in the Steel City. 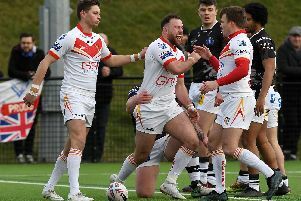 Aston though admitted he saw the signs of potential during a training work out against Castleford last weekend, reiterating his pre-season rhetoric regarding the Eagles’ improvements since last season’s narrow escape from the drop. “When you have got smart footballers, do you need friendlies? We play a lot of rugby don't we? You have to break it into them. You take a bit of a punt. We had an opposed session against Castleford last week and we were really good. We took a lot of positives from that and have gone into the game today and really turned it on. Great crowd, great atmosphere and a great result.